This blowout music bash is set for Oct. 14-16 at Ace Hotel New Orleans at 600 Carondelet St. and will serve as a launch party of sorts for the 2017 Stomp. Midway through this special showcase, on Oct. 15, the initial list of official 2017 Stomp performers will be revealed (live plus on Facebook and Twitter), and tickets and travel packages will go on sale! The festivities kick off Friday night (Oct. 14) at 9 p.m. with a FREE show inside Ace Hotel New Orleans’ Three Keys: Octogenarian north Mississippi blues and gospel guitarist Leo “Bud” Welch headlines, with opening music by New Orleans rockers The Fortifiers, led by former Tipitina’s and House of Blues talent booker Sonny Schneidau. A lumberjack in Mississippi’s hill country for more than three decades, Welch has played guitar since 1945 but flew under the outside world’s radar until his genius undeniably surfaced about 2013. Now a Big Legal Mess label recording artist, he’s collaborated with musicians such as Jimbo Mathus and King Louie Bankston and has released two critically acclaimed CDs: “Sabougla Voices” (2014) and “I Don’t Prefer No Blues” (2015). Saturday (Oct. 15) features three of the Stomp’s most beloved acts who hardly need any introduction: Texas R&B-soul guitarist Barbara Lynn, fellow legendary Lone Star vocalist Roy Head, and Louisiana Creole six-string wizard Paul “Lil’ Buck” Sinegal and his Buckaroos. A striking left-handed picker and original songwriter with an emotion-drenched voice, Lynn (aka “The Queen of Gulf Coast Soul”) hit the big time in 1962 with “You’ll Lose a Good Thing” and has been covered by the Rolling Stones, among others. A nonstop tornado onstage and most famous for 1965’s “Treat Her Right,” Head has dazzled Stomp audiences into the wee hours with his gravity-defying moves, gut-wrenching vocal shouts, and pleading-on-his-knees balladeering. And serving as the Stomp’s longtime bandleader, Sinegal perfected his stinging tone for years on the bayou chitlin’ circuit with legends such as zydeco king Clifton Chenier and organist-accordionist Buckwheat Zydeco, as well as waxing the immortal brass- and guitar-driven classic single “Monkey in a Sack.” Tickets for this 9 p.m. show featuring the cream of the Stomp’s crop is just $10 at the door. 2017 STOMP TICKETS ON SALE OCT. 15! Saturday also will serve as D-Day for the 2017 Ponderosa Stomp announcement. That’s when the curtain finally will be lifted on the long-awaited lineup for next year’s three-day festival — plus tickets and travel packages will go on sale! The 2017 performers also will be unveiled on the Stomp’s social-media platforms (Facebook and Twitter). Then, on Sunday (Oct. 16), another FREE show: Fresh off a recent tour with the universally hailed Hurray for the Riff Raff, Norton Records‘ savagely primitive power trio Daddy Long Legs will close out the Stomp’s invasion of the Ace Hotel with their manically heart-stopping, harmonica-fueled lugubrious death blues. Sharing the bill will be Crescent City kingfish Guitar Lightnin’ Lee and his Thunder Band, a gutbucket R&B favorite everywhere from European concert halls and rathskellers to the salty saloons of the 9th Ward. We invite you to join us for this fantastic precursor to the 2017 Ponderosa Stomp. The event is largely free and takes place within the cool confines of Three Keys at Ace Hotel New Orleans, in the heart of downtown. And if you’re already in the Central Business District that weekend for the nearby Crescent City Blues and BBQ Festival at Lafayette Square, Ace Hotel New Orleans is the perfect oasis for capping off your day’s blues excursion — with even more blues! We’re hoping this small taste of the one-of-a-kind music on tap at the Ponderosa Stomp will inspire you to buy tickets for the 2017 main event. The 2017 Ponderosa Stomp will feature old favorites, new surprises, and all the events that have fans coming from around the world year after year: the two-night concert in New Orelans, the DJ Hip Drop at d.b.a. on Frenchmen Street, and the vinyl Record Show and the Music History Conference — with both of the latter showcases at Ace Hotel New Orleans. 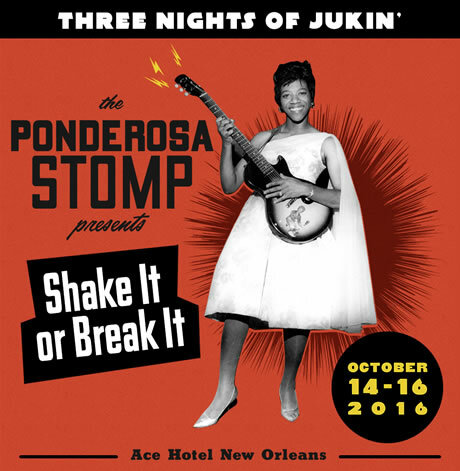 So pencil in our Oct. 14-16 invasion of the Ace Hotel, get geared up for the official lineup of the 2017 Ponderosa Stomp, and buy your tickets ASAP. As the 2015 Stomp proved — even in Louisiana, where dozens of festivals are letting the good times roll on any given weekend — this is one musical extravaganza that keeps getting better and better!